Two weeks are left until I tie the knot with my beautiful fiance, and I love her so much because she understands my need to wander and fish along one of Arizona’s most beautiful trout streams. I was joined by my friend Pete who was seeking to get rid of the skunk from our earlier trips together. 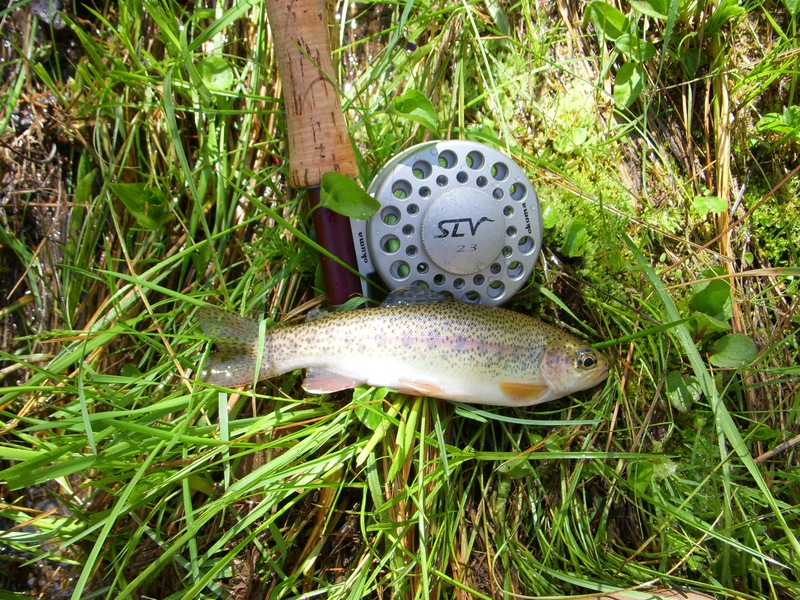 I decided to hit a tried and true favorite where I knew that rainbows and browns would oblige and make our efforts worthwhile. Action started on the first cast and did not stop until we turned back for the truck. The fly of the day was again the parachute adams. Fish seemed to be holding in the faster riffles and greedily launched themselves out of the water to get their meal. 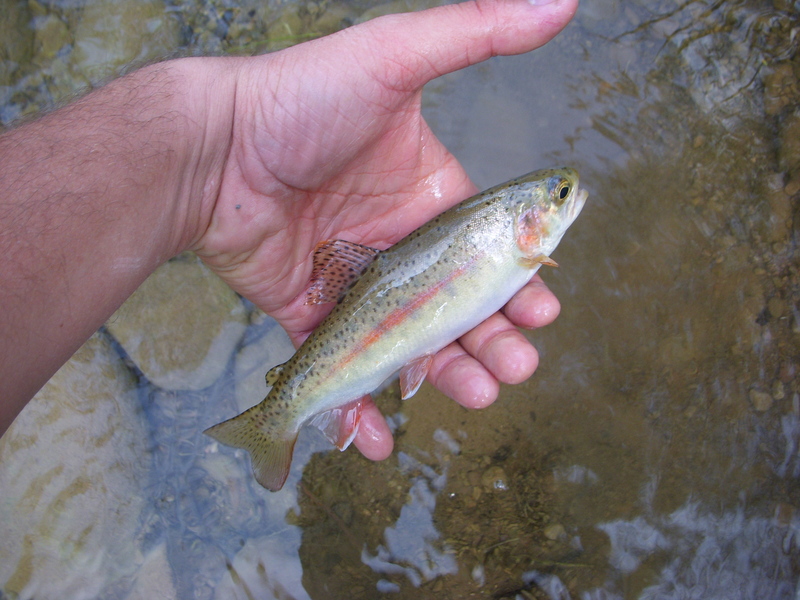 Fishing was extremely consistent with most fish being rainbows at about 6-8 inches with one larger rainbow pushing 13. A couple of browns joined in, but nothing of any real size. I enjoyed the day thoroughly knowing that it was going to be my last time on the water until after the wedding. Family and friends are coming into town in the next few weeks and last minute details will need to be taken care of. Classes run for two more weeks at school and my students are already shutting down and ready to go. It is unbelievable how fast this year has passed. 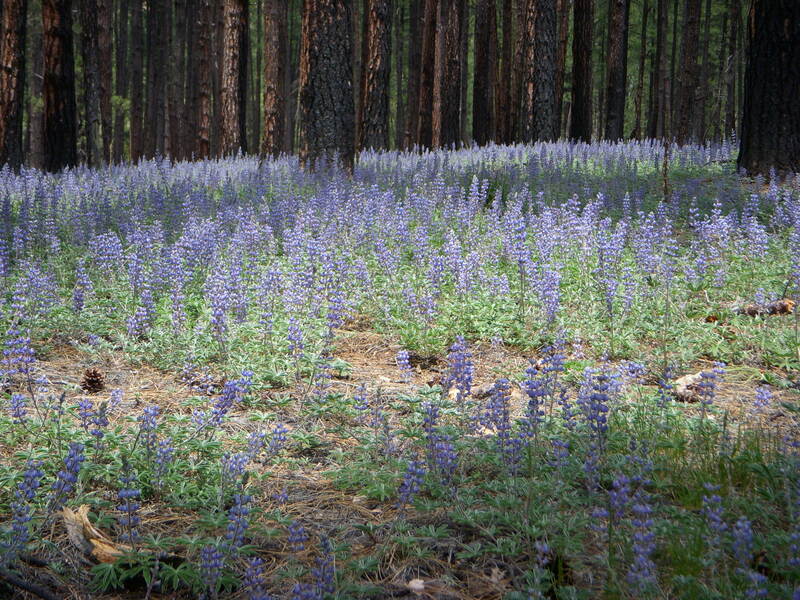 I myself am excited for the summer months that will be spent roaming around northern Arizona. 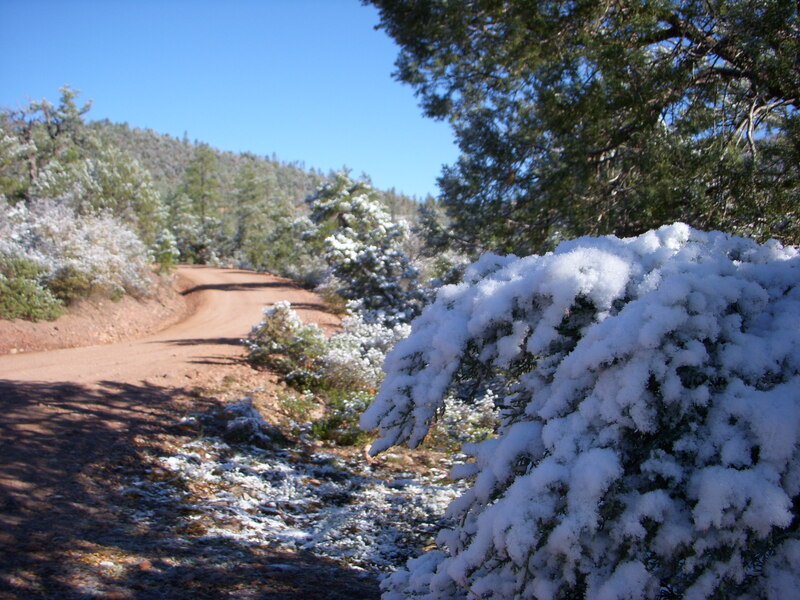 I have a list made of several places to explore that should keep me busy in the cool north and out of the concrete jungle of Phoenix. After an extremely cold night in a tent spent dreaming about extra blankets and a bed, I woke up for breakfast and coffee before the sun was up. I broke down camp and was on my way to search for the fabled Arizona brook trout as the sun was just hitting the top portion of the Rim. 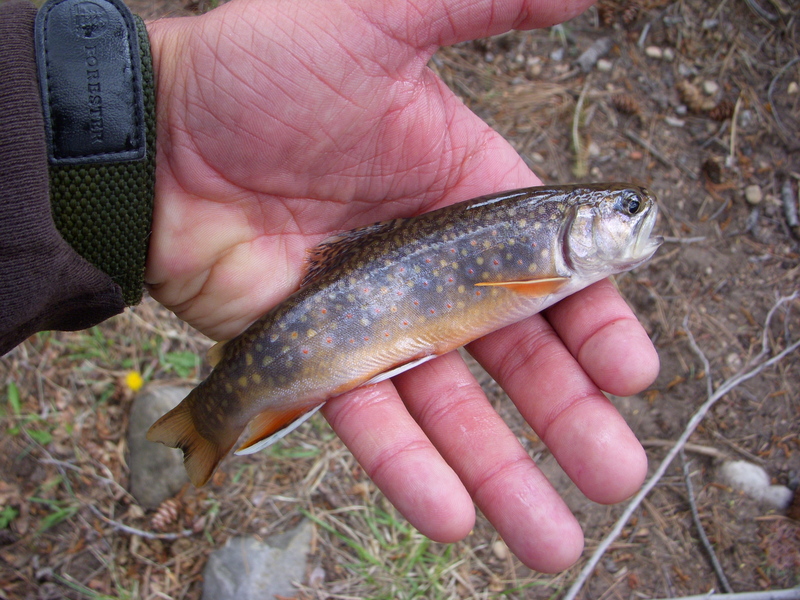 Since moving to Arizona, I have been under the impression that there were no brook trout in the state. 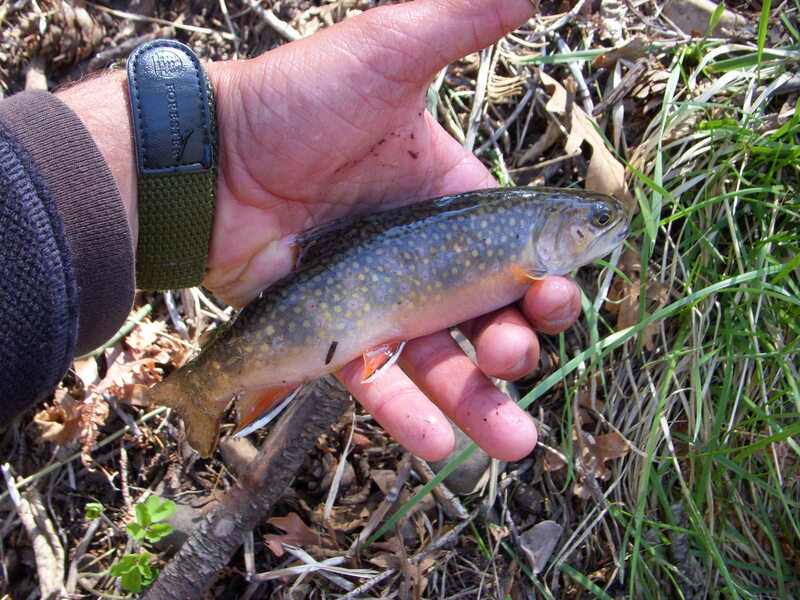 From my limited knowledge and inquiring, brook trout were stocked in certain areas many years ago by the Game and Fish and can still be in certain lakes, but finding the location of the few guarded streams that maintain reproducing brook trout has been very difficult. After many hours researching and asking questions, I happened upon a name. The name was enough and this weekend I visited that small sanctuary that held those trout. The stream was extremely small and I could stand with a foot on either side for the most part. about half way up I found a deep pool and watched my line go tight with brookie after brookie who thought my fly looked like a tasty breakfast. 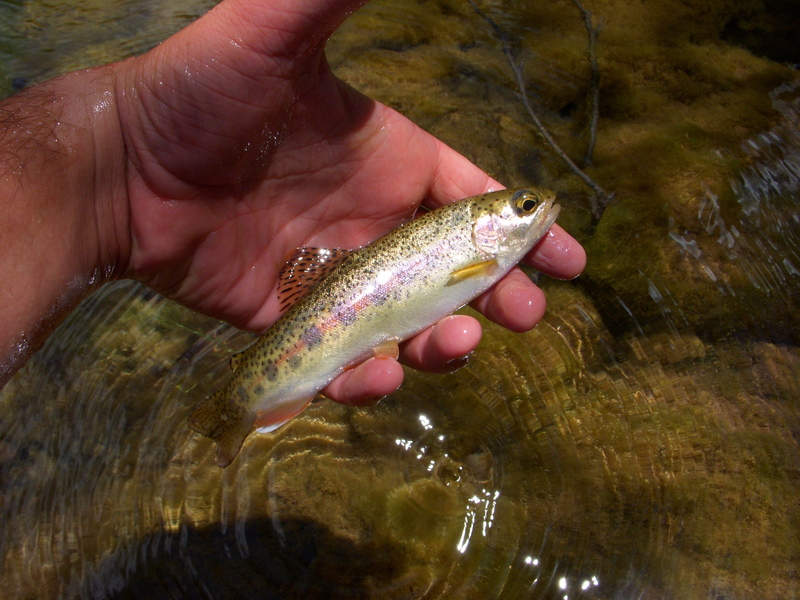 Most of these colorful fish were 4-6 inches, the largest was 13. This stream was the most difficult fishing that I had ever experienced with tree limbs hovering a few feet over the water and briar patches littering the banks and ripping at my waders. 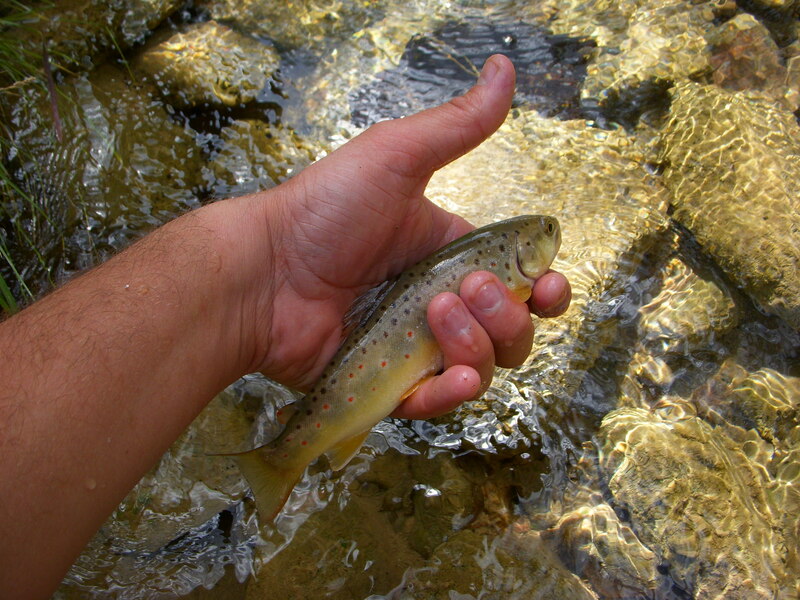 The end result was well worth it with a dozen or so brook trout to hand. 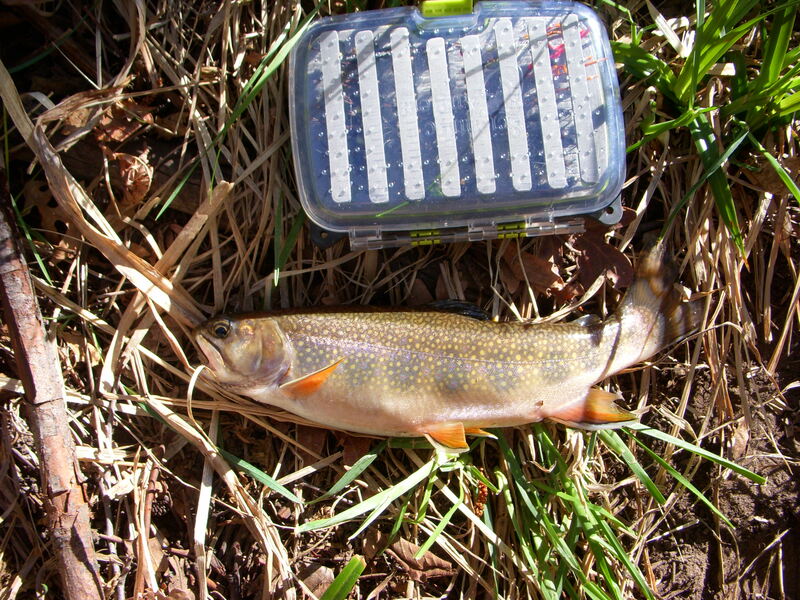 I now believe the fables and legends of the Arizona brook trout. 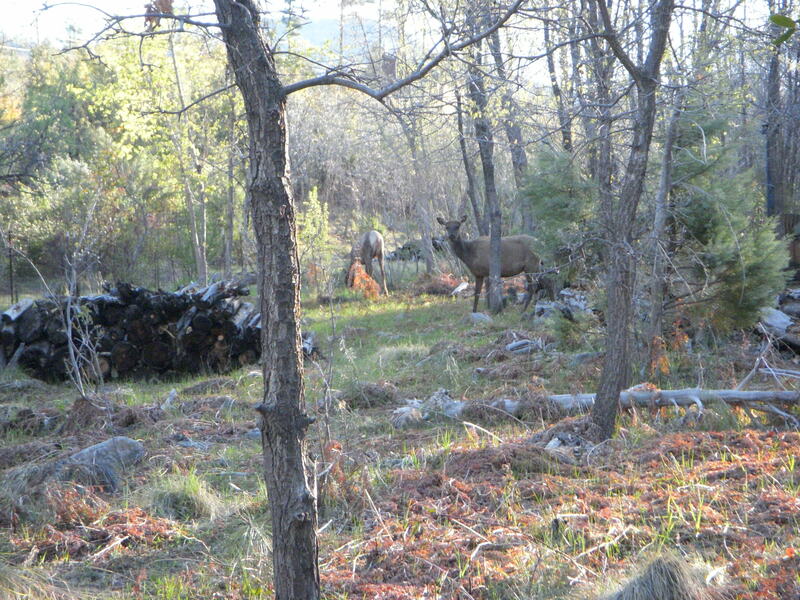 It was about 7:30 at around 5,000 feet of elevation when I started second guessing my decision to go fishing. 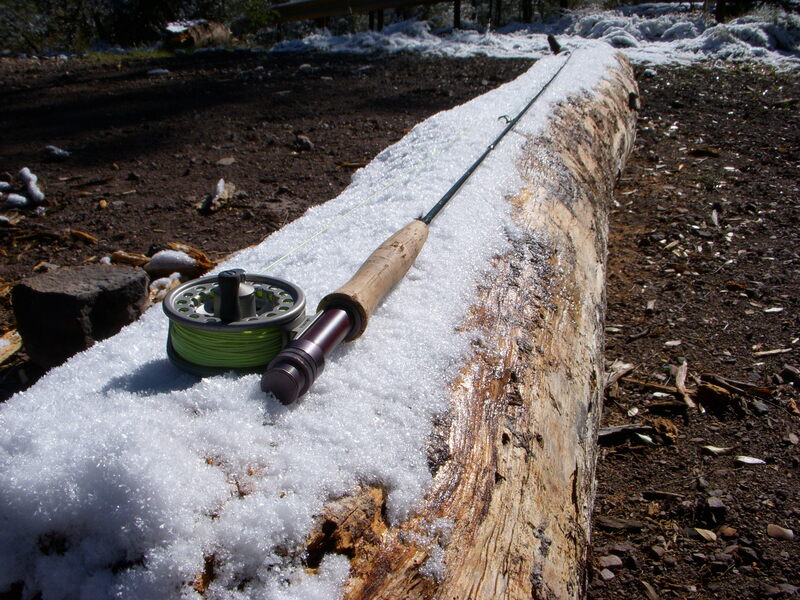 All the trees were topped with a fresh coating of snow and even though the heater was cranking in my truck, the thought of having to tie on a fly in freezing weather sent a cold chill down my spine. The plan was to fish for the day and keep an eye and ear open for any sign of turkey for a friend who was coming up to hunt the next day. I saw no sign of turkey but the crystal clear creek gave up plenty of fish. I fished from about 9 am to 4 pm and lost track of how many fish I had landed. 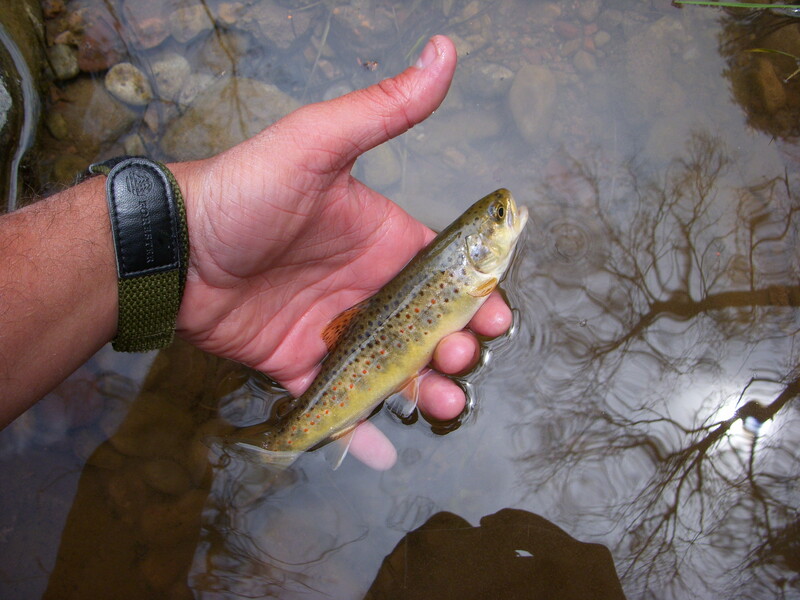 Most of the fish that came to hand were rainbows but a few browns were in the mix. From what little I understand about this particular creek, Game and Fish stocks at a bridge a mile or two down stream. 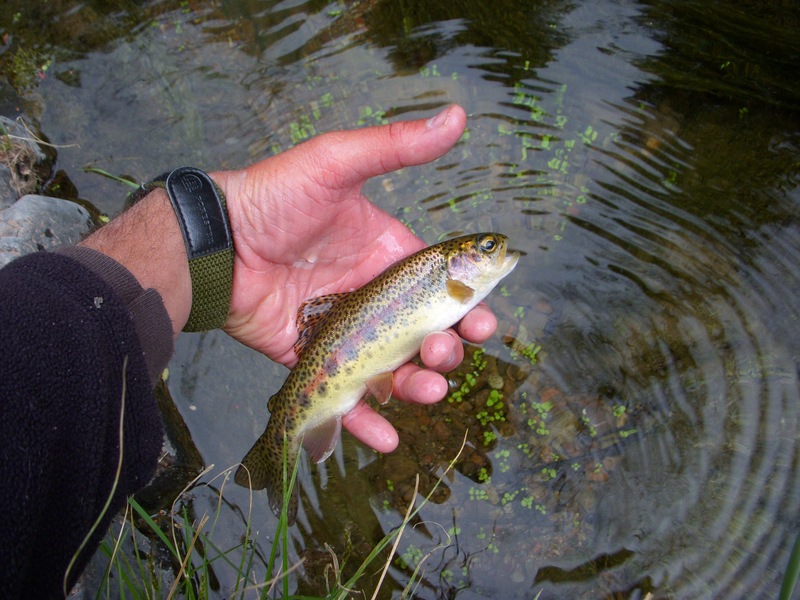 The rainbows that were nipping at my line were full of fight and color, and did not appear to be recent stocked trout. 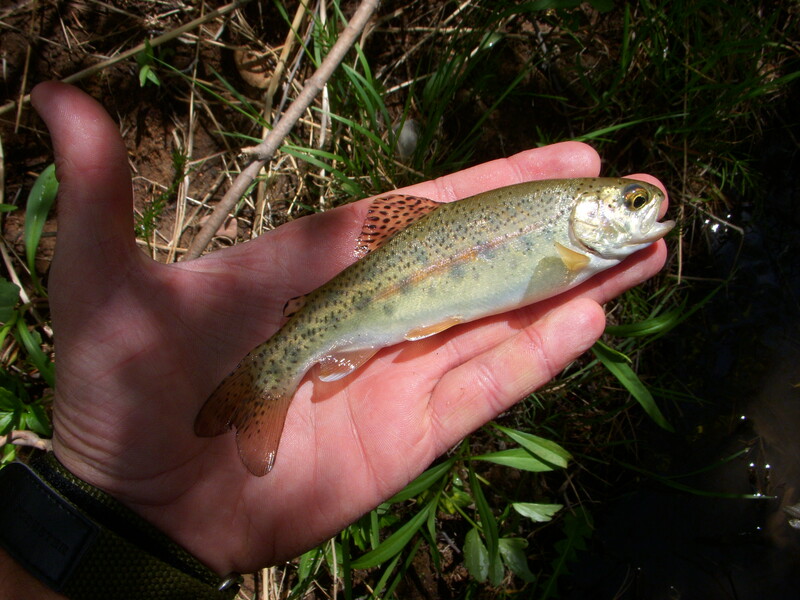 Whether stream born or holdovers, they were extremely colorful and no two were the same in their shadings and spots. The average size was around 6-8 inches with a few pushing 10-11 and every fish I landed day came on a parachute adams. 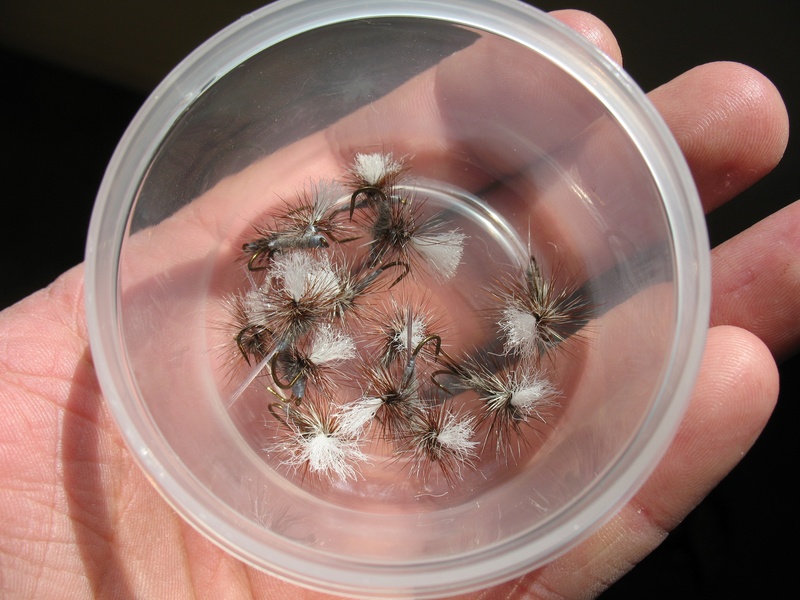 I attempted several times to switch up my rig to tempt any of the bigger browns in the deep pools but had no luck. The creek was the best I had ever seen it and I walked farther than I ever had before. 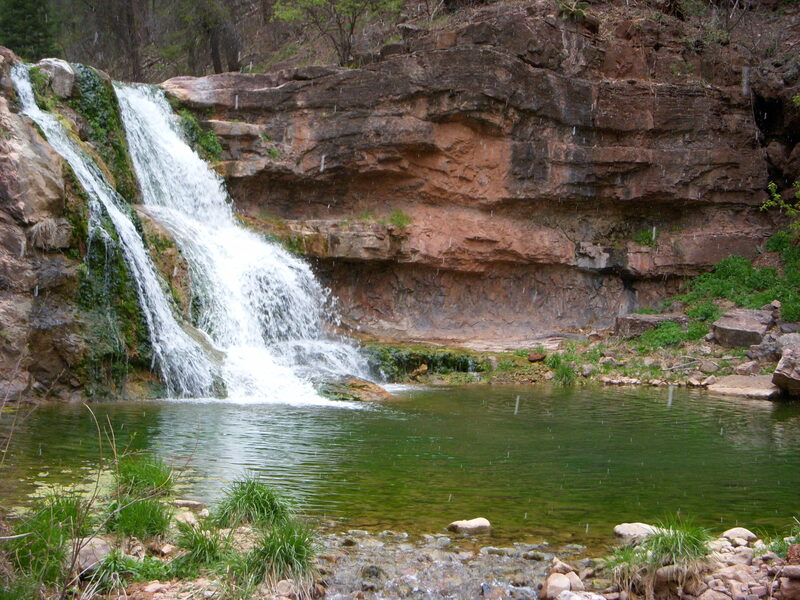 At the end of my hiking, I was greeted by 25 foot falls that cascaded into a beautiful green pool. I worked my way to the top of the falls and fished farther on only to find the creek thinning out very quickly with no fish present from what I could tell. The trudge back and out of this particular creek is a real bruiser at the end of a long day, but I made it to the truck in good time and found a decent spot to camp for the evening. As the sun went down and the fire started to warm my hands and feet, I made plans for the the following day to check out a creek that I had only heard rumors about.